Kitchen-pantry Cleaning before vacation, uffff!!! Checking and organizing, things that can be used later and things to be finished before leaving. While doing that, this Can of Pie Filling hiding behind a stack of Flour packets, grinned!!!! Oh my, when did i buy this???? mmmmmmmm, not able to remember!! Sigh!!! Okie, it has be finished before July end. So, think, think, No Pies,!!! Shall i make Pannacotta, Hubby Screamed, No Cream!!!!!!! 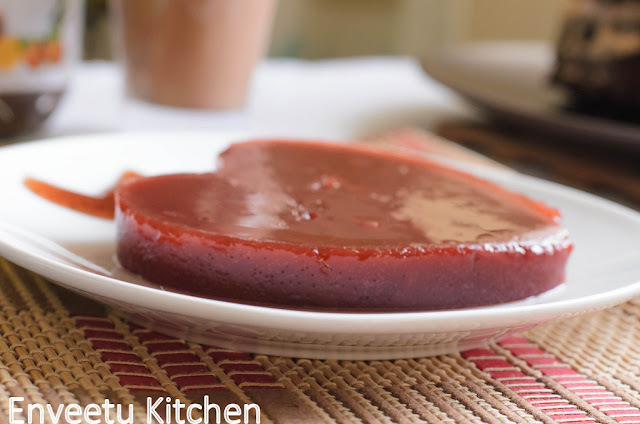 Kuttu: Amma But Jello, should be a bit see through, kinda transparent!!! Amma(to herself) : Fast, Think another name!!!! It is Faux Cherry Pannacotta!!! Howzzzat??? 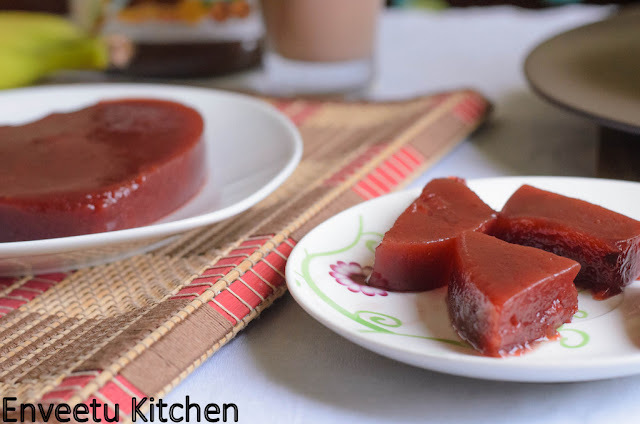 Soak Agar-Agar in 1 Cup Hot Water for 10 minutes. I get Agar-Agar/China grass stalks. Whenever i make Pannacotta, i break them into small pieces and Soak them in Hot Water to ease the process of melting while cooking them. Take the Agar-Agar Soaked Water to stove, Cook it in a Very low flame, Do not allow the liquid to boil. Keep it low and Stir to combine and melt. It will start melting after 10 minutes on the low flame. While this is cooking, Open the can of pie filling, take it in a blender add sugar and blend until smooth. Transfer the blended cherry filling to a sauce pan and start heating in a slow flame. Take care, it will be very thick, so there is a chance of it burning and it might also splutter out of the vessel, so keep the flame low. When it is almost hot, and ready to boil, add vanilla extract and mix well. Now add the melted agar-agar using a strainer. 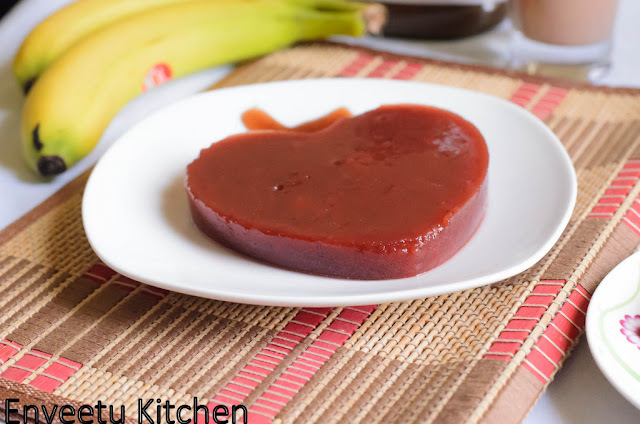 This is to avoid any agar-agar goo getting into the finished dessert. Stir to combine well. Take it off the stove, let it cool for 10 minutes, pour them into moulds and . Let it rest on the Kitchen Counter for 30 mins, then refrigerate atleast 4-5 hours for the Dessert to set. While Serving, un-mould it on a plate, cut into squares and serve. To Get more Smiles, Serve it with a blob of Fresh Cream or Whipped cream on top. Sending this to Kids Delight - Party Ideas, happening @ Sizzling tastebuds, Event by Srivalli. Lolz loved the way u named this jello, excellent Priya..Very cute and refreshing pannacotta. Wonderful dessert yaar, and yes, i can imagine myself how tough it is to clean swipe refrigerator before leavg home. Delicious Panacotta with agar agar. Priya..you get looks and not smiles if you serve with cream:))..I am a big fan of agar agar and there is a new pudding with it twice a week! !love that color..pretty. 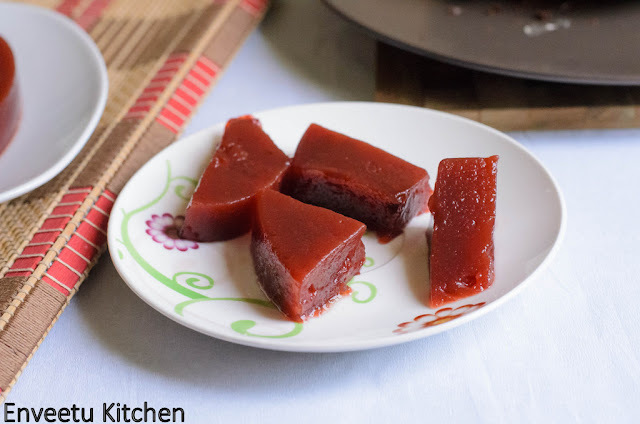 If you hadn't told me, I would have thought this to be a halwa...like at our home, take anything and make a halwa. Nice that you managed to do this ..and heart shape looks cute..
Nice idea. Pannacotta looks lovely. Looks lovely. I am yet to try my hand at the various pannacottas! Looks perfect, yep it looks like halwa too. Do we really need 1/2 cup agar agar for this.